The red-white bicolour is traditionally associated with the festivities of Boishakh. With blooming boutiques, experimentations with shades and hues are now observed, while others opt to venture into new frontiers with motifs, keeping the conventional shades of pure white and burning red. Aarong defines Boishakh, Aarong's Boishakh palette this year includes a host of radiant colours, but more interestingly, it offers a very unconventional yet trendy look to the most traditional festival of the Bengali culture. Each piece from the classic saris to the chic kameeze, kurtas and men's punjabi, carries a different hue of colours, cuts and a new definition of style! The boishakhi colours range from ruby red, rust orange, brilliant yellow to royal blue and emerald greens. Interesting forms of embellishments such as ribbon embroideries, matte metal beads, silk patchwork paired with bold prints are used on cotton, silk and kota muslin saris. The salwar kameez collection come with bead works, appliqués and subtle hints of sequins with interesting cuts and new designs in churidar and salwar. The men's punjabi come in festive shades with different fabrics such as tussore, jamdani, muslin, handloom cotton to addi adorned with cord embroideries, intricate zardozi and hand stitch. Chondon brings forth their bright, Boishakhi line at their outlet in Gulshan. The festive, attires will remain on display from 3 April till 13 April. Adroit Collection brings for the fashion conscious works of block prints, karchupi, tie and dye, embroidery and spray paint on saris, kamiz, fatua and t-shirts. Prices seem reasonable, ranging as low as Tk 140 (t-shirts) to Tk 4000 (saris). Anyamela highlights on the use of different fabrics with value addition for their Boishakh collection. 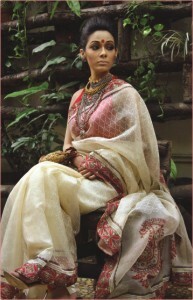 Muslin, Joi Silk, taat, khadi and cotton have been extensively used for their designs. Works of karchupi has beautiful patterns done with thread, sequins, stones, beads and glass. The prices seem to be on the higher side but the collection is definitely worth a look this festive season. A contrast to Anyamela, Deshal brings in a wide array of motifs in their attires. For the bold who dare to try and carry everything, Deshal brings forth a reflection of timeless shokher hari in their depiction of owls, birds, dolls, and elephants on their dresses. The prices seem to be reasonably lower than other brands. The traditional house of Kumudini has a rather festive get up this Boishakh. The prices reflect the high quality of fabric and design, which everyone seems to desire. Shatabdi comes with an array of block printed designs. The colour scheme features a plethoric use of white, green and blue: no doubt a refreshing change as the coming of the new year is indeed about festivity and life! Tribhuj started off with the promise to break away from traditional and emerge as a house for fashionable t-shirts. 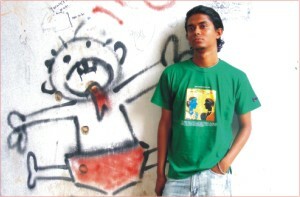 They design shirts depicting artistic creations of renowned painters, as well as young talents of the country. Keeping the coming Boishakh in mind, Tribhuj brings out their line of casuals based on the works of Abdush Shakur and Atiqul Islam Tulsi. Lastly, we present Tohu's Creations, Prabartana and Banglar Mela and Mrinmoyee- through vibrant use of colours and fabric, their products steal the show. Prices are reasonable and few designs indeed stand alone in the crowd. Mix trends and tradition this Boishakh, and re-invent your look. Lifestyle wishes its readers Shubho Noboborsho. As there are only a few days left before the beginning of a New Bengali Year, this time around you will get to see nature in its amazing contrasts. Along with the scorching heat of summer there are possibilities of heavy downpour. But the most fascinating part is the way nature carries its elements. It is nothing surprising to find the sky turning grey and the gusty wind creating whirls of dust. On the street, you watch in awe the flash of lightning, just like strobe lights, creating an indescribable aura. You may even wonder how nature can be a perfectionist in making a memorable moment. It is not a usual sight, and if you get to see trees around you, then the rustling of the leaves will be more overwhelming than a classic orchestra. The swaying of the tall trees will make you believe that they are performers, with a drama queen at the middle bowing out from an evening show. The final moment is not a long wait. Soon you feel the splash of the first drop. The storm starts in no time. You feel life come to a stand still, mesmerized, regular chores of life coming to a pause. You can even enjoy getting drenched in the rain. Nothing can be more thrilling if you have people around you, who are as excited to find out all that nature has to offer. There is a likelihood of hailstorms, so if you get to experience one, try and be careful because collecting hails can be a nostalgic, and satisfying experience. This whole month is full of things that are happening, so embrace nature cordially and make the best out of it.